In Blind Dates, Levan Koguashvili’s second feature film, Sandro, a school teacher, struggles with his love life. Though his best friend Iva arranges meetings with attractive strangers for them (hence the English title), Sandro – reticent and shy – is an awkward date. That is, until the two friends meet Manana during a trip to the seaside. Sandro falls for the appealing hairdresser, and for a short while, the film has a discernible driving force: Sandro, who’s determined to get together with Manana, tells her, “If you want, we’ll be together”. But then there is Tengo, Manana’s husband, who’s about to be released from jail, sidetracking both the narrative and Sandro’s intentions. Suddenly, Tengo and his problems are the subject of this film as Sandro drifts into a role of mediator and martyr. At fortysomething, Sandro still has to bear his father’s persistent haranguing about life and love, and, worse yet, seek permission to use the family’s car. What the story tells us is that deep down, Sandro is a good guy, and that life isn’t easy. Still, with no particular intentions guiding his actions, it is difficult to like Sandro, whose excessive idealism is unintuitive and selective; in the beginning, he tails Tengo because Sandro’s convinced he’ll be able to get together with Manana, but soon he starts helping Tengo in pursuing his morally dubious endeavors (which includes defrauding a fellow ex-jailmate’s family to pay for an abortion for his secret lover against her will). 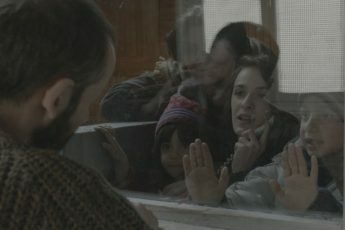 As Koguashvili revealed in an interview with our journal, the film’s underlying theme is Georgia’s so-called “lost generation” (roughly Milennial), which was marked by wars and drug epidemics in the 1990s. Like Dimitrij from Zaza Rusadze’s A Fold in My Blanket, another recent Georgian film, Sandro is mostly just lost and thus a relatively lucky example for an otherwise tragic era in Georgia’s history. Since Koguashvili and Rusadze give few reasons for their protagonists’ single-hue psychological state, their films reveal less about their country than about the risk of constructing a film around shallow protagonists. Using strong, if unlikely conflicts, melodramatic music and solid images (Tato Kotetishvili), Koguashvili steeps confusion in emotion. The humor alleviates, but falls short of relativizing the film’s stern message. Inevitably, the product is mostly pathetic and at times ambivalent: when Iva goes to a hotel room with a date who is blind (pun intended? ), I had trouble descrying Koguashvili’s intentions. Even if it is not to be funny, it’s difficult to sympathize with such a frivolous way of illustrating Iva’s and Sandro’s sexual problems (it doesn’t help that Iva does not end up sleeping with his date). Poised between comedy and drama, Koguashvili puts too much faith in the viewer being able to switch emotional wavelengths in a film which lacks both narrative logic and likeable characters. Not everything about Koguashvili’s film is histrionic. The fights between Manana (Ia Sukhitashvili) and Tengo (Vakho Chachanidze) resonate with Georgian female-male discrepancies and are well-performed. Besides, Koguashvili has the right intuitions about which parts of everyday life have comic potential; Blind Dates is one of those few films where I feel more or less comfortable conjecturing that the final product doesn’t match the potential of the screenplay (co-written by Boris Frumin, Koguashvili and main actor Andro Sakvarelidze). This is mainly a problem of directing. 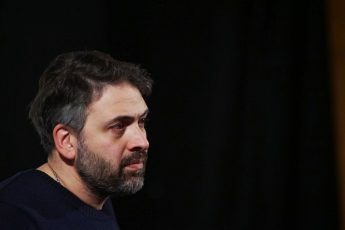 As professional actors, Chachanidze and Sukhitashvili outperform their amateur counterparts – including Sakvarelidze in the role of Sandro – who are as gauche on screen as they were in Street Days (2010). Others, like Kakhi Kavsadze (also a professional), are over-eager to match comedic intentions and thus lack subtlety. Taking a screenplay (even a good one) to be more than a road map is dangerous. For a film obsessed with “Georgian life”, life is what Blind Dates lacks most: we find characters instead of people, conflicts instead of problems, and dialogue instead of conversation. This is “reality” at best.